Pitting many of the top Class A Boys teams from both sides of the state, the Radke/Orvik Classic rotates every year between Minot and Fargo South High School. In last year’s meet at Fargo South, the Red River boys won the storied meet for the first time since 1983. The 2018 edition was held Friday in Minot and utilized true team scoring, where the emphasis is placed on overall team depth. Each school is allowed to enter only three athletes in each event and every competitor scores. With the cool and windy weather, the Roughriders amassed 632.5 points, good enough for third place. Bismarck Century placed first with 665 points and Minot finished second with 656 points. The top three point scorers were once again Bryce Enerson (16 pts), Pierson Painter (14.25 pts), and Tyler Burian (14 pts). Enerson won the 110 hurdles (15.49), placed 5th in the high jump (5’10), and seventh in the 300 hurdles (43.99). Painter qualified in the 110 hurdles for the first time (4th-16.09), finished second in the 300 hurdles (41.52), and ran on the fourth-place 4×400 relay team. Painter finished second in the 300 hurdles (41.52) and fourth in the 110 hurdles (16.09). His hurlde times are remarkable, considering it was just his fourth time running the hurdle events. Burian placed third in both the 100 (11.33) and 200 (22.58), as well as running legs on the 4×400 and sixth place 4×100 team. Senior Seth Hanson continued his strong javelin season, reaching 183’0 on his last throw. The performance puts him at #10 All-Time in the tradition-rich javelin event at RRHS. Sam Schumacher (5th) and Liam Ogren (7th) also placed for the Riders. With four state qualifiers returning from 2017, the javelin is the highest scoring event for the team this season. Another exciting finish was the 4×800 relay team of Marcelles Sartwell, Stoker Short, Rapha Onyeka, and Cole Stenseth, who ran a season-best time of 8:30.44, missing the qualifying standard by just six seconds. Grand Forks hosted the EDC Boys JV Meet Saturday on a beautiful day at Cushman Field. Red River brought home the team title after a third-place finish last season (261 points), over 60 points in front of runner-up Davies. An all-around team effort was used in the victory, as the Riders scored in every event except the pole vault. Both hurdle events provided big points for the team, with the 300 hurdlers placing 1, 4, 5, 6, 7, 8 and the 110 hurdlers finishing 1, 2, 4, 5, 8. The distance events also received strong finishes, with the 3200 placing five (2, 3, 5, 7, 8) and both the 1600 (1, 3, 5) and 800 (2, 7, 8) placing three athletes. The final regular season meet is named in honor of Coach Bob Zimney, who served as the Red River Boys Head Coach from 1979-2015. The most exciting storyline in this meet was the return of sprinters Thomas O’Halloran and Zack Topping from the disabled list. With a generous tailwind, both athletes showed their speed by placing 1-2 in the 100m Dash with state qualifying times (Topping-11.17/O’Halloran-11.27). The 4×200 meet record was set in 1983 by the Red River team of Troy Judd, Craig Larson, Jason Horne, and Bob O’Halloran at 1:31.93. Fast forward 30 years, and Red River had another O’Halloran anchoring the 4×200. This time, it was Thomas, Bob’s son. Not only did the team of Topping, Burian, Painter, and Thomas win the event, they TIED the meet record at 1:31.93. Father and son both anchoring record-setting teams 30 years apart, in the exact same time. The odds of that happening are astounding. In the 2018 state rankings, 1:31.93 sits #5 (#3 in the East). Beautiful weather and strong tailwinds produced favorable sprinting conditions, but made most events longer than 200 meters difficult. The field events saw a number of PR’s for the Riders, some of whom competed in their last meet for the 2018 season. 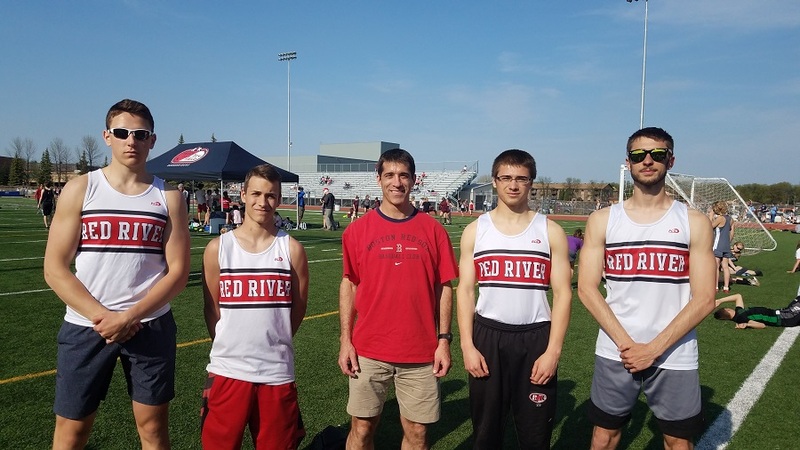 Check out the RR Boys Results at each meet to see the number of PR’s from each meet/event. You will find many, especially in the sprints. Athletes are peaking at the right time and ready for the East Region Meet on Friday, which only allows five athletes per event. Athletes placing in the top-six of their event, or who achieve the state qualifying standard, will advance to the state meet the following week in Bismarck.